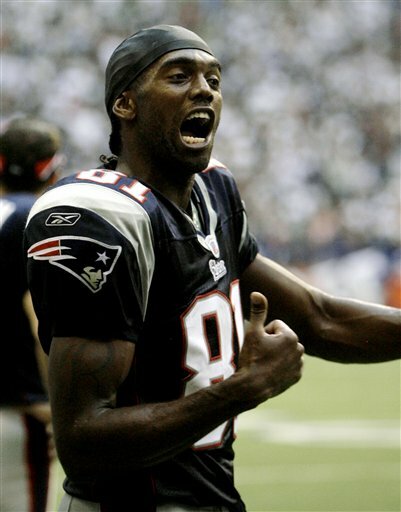 Randy Moss is a wide receiver for the New England Patriots, and enters the 2008 fantasy football season a lot like his teammate, Tom Brady; he set the single-season receiving touchdown record. Because of the huge numbers, Randy Moss will be a definite 1st rounder based on those numbers, especially if he’s in a league that gives points for receptions. What you have to remember with Moss, though, is the Patriots got him so cheap (trading only a 4th round selection) because Moss had missed significant time the previous three seasons (2 with the Raiders, 1 with the Vikings). Therefore, Randy Moss remains an injury concern, if not an injury risk. Moss is in his thirties now, so any player would have a certain amount of risk, anyway. Many people thought Moss was faking injuries with the Raiders, so his injury concerns might have always been overstated. Moss is a flake, though, so I’m assuming if the Brady-Moss connection will eventually fall apart because of the Moss side of the bargain. Coming into this year, though, it’s a deadly combination and they should rack up huge numbers. It helps that their division rivals (Bills, Jets, Dolphins) are all mediocre or worse. That’s six games a year the Patriots are playing teams that are (at their best) average. Moss initially signed a letter of intent to Notre Dame, but after a fight that ensued at his school Notre Dame revoked his scholarship. Florida State then took a chance on him but since the letter of intent had already been signed to Notre Dame he had to be red shirted his freshman year, during which time he ran a 4.25 40 time, only .02 seconds less than what Deion Sanders had previously run. After testing positive for marijuana during his probation period Moss released by Florida State, and moved to Marshall University which at the time was a division I-AA school. He displayed excellent ability during his first season and when Marshall became a division I-A he continued his fine form to be considered for the Heisman Trophy. Randy Moss entered the 1998 NFL Draft and, though he was projected as being a high first rounder, he dropped down to the 21st pick overall. This was most likely due to the off field highly publicized legal problems. The Minnesota Vikings did take the chance though and repaid with a great rookie season by Moss who was voted Rookie of the Year and subsequently picked as a Pro Bowl starter. His fine form continued with only fairly minor discipline problems, with the 2003 season a particularly excellent one. Randy Moss was by any standard one of the elite wide receivers in the NFL, and he was the face of the Minnesota Vikings franchise. After Dennis Green left the as the Vikings head coach, though, the team began to struggle (it had struggled in Green’s final season, too.) Dante Culpepper and Randy Moss were not always on the same page, and there was talk that the team would have to trade one or the other of their star players. There was also discussion that Randy Moss’s contract in excess of $80 million made it difficult for the Vikings to add quality players around Randy Moss and Daunte Culpepper. After the 2004 season — one in which Moss missed significant time due to injuries — Randy Moss was traded to the Oakland Raiders. 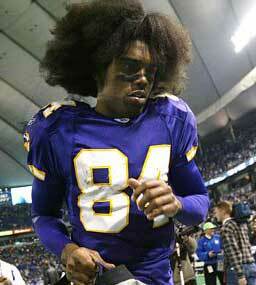 In 2005, the Minnesota Vikings (now owned by the "morally upright" Zigi Wylf) traded Randy Moss to the Oakland Raiders. The Raiders had been awful since a 2002 trip to the Super Bowl, so the move was held with optimism. Unfortunately for Al Davis and the Oakland Raiders, the "bad" Randy Moss showed up in Oakland, and he continued poor play after he arrived. Many believed that Moss’s nagging injuries, which caused a huge dip in production, were the result of Randy Moss’s poor motivation to play with a sub-par Oakland Raiders team. The Raiders, thinking Moss was faking injuries, decided to get rid of Randy Moss after two disappointing seasons. On April 29th 2007 Moss was traded to the New England Patriots, where he resurrected his career. Pairing Randy Moss with Tom Brady proved to be the most successful regular season QB-WR in NFL history. In 2008, Brady�s and Moss’s fantasy years will depend on one another. Though it�s easy to believe he will have a great year again, likewise Randy Moss has nowhere to go but down. They call it a career year for a reason, so don’t expect to see Moss match the crazy numbers of last year. That doesn’t mean Randy Moss cannot be the best fantasy wide receiver in football this year; you just can’t expect him to score 23 more touchdowns in 2008. New England has already stated that they plan on taking Moss off the field more this upcoming season, as he seemed to slow down as the year wore on. Though most teams won’t be able to bring the pressure the way the Giants did in the Superbowl, you can expect teams to find new ways to pressure Tom Brady. The Patriots still have Wes Welker on the roster, but a question remains about whom will start across from Randy Moss. Welker was highly successful as the slot receiver last year, so it would be a mistake to move Welker outside. Chad Jackson will probably get the first shot, but he’s been a major disappointment to this point. Defensive coordinators will spend all offseason trying to find ways to stop Moss and Welker, and I expect that teams will focus less on the New England Patriots new "Y" receiver than they did Donte Stallworth last year. So the teams that Moss ran ragged might be able to use double coverage against him. Moss’s numbers won’t be as good as last year, though there was a huge gap in Moss and the rest of the fantasy receivers last year. If Brady goes against the grain and doesn�t have that slump that some seem to expect and Moss stays clear of both injury and the shenanigans, then he will again be the number one wide out in the league, hands down. Randy Moss was on a mission last year; with the loss in the Super Bowl, the mission might continue.